Prof Eoin O’Brien examines the recent RCSI and NUI submissions to the Oireachtas on RCSI-Bahrain. Lloyd Mudiwa’s recent report in Irish Medical Times (April 11, 2014) on the appearance of the RCSI and NUI in front of the Joint Oireachtas Educational and Social Protection Committee makes disturbing reading for a number of reasons, and merits closer scrutiny. Let us remember that the reason for debate in the Oireacthas stems from two eventualities. First, the Royal College of Surgeons in Ireland (RCSI) has invested some €60 million in a medical and nursing school, RCSI-Bahrain. Second, what began as a peaceful protest in the Spring of 2011 as part of the so-called ‘Arab Spring’ was a reaction to years of sectarian suppression and mounting poverty among the Sunni-ruled Shiite majority, with a demand for the establishment of a democratic constitutional monarchy and the recognition of human rights rather than for the downfall of the ruling regime, as was being sought in other Arab states. This protest was brutally suppressed when the King of Bahrain, Hamad bin Isa al-Khalifa, sought the assistance of Saudi-led forces in March 2011. More than 35 people were killed and 47 doctors were among at least 1,000 citizens imprisoned without trial, tortured, charged in military courts and given preposterous sentences. In the aftermath, both the RCSI and RCPI (which confers the joint licentiate to graduands from RCSI-Bahrain) failed to acknowledge the protests of international humanitarian groups, such as Médecins Sans Frontières and Physicians for Human Rights, in condemning flagrant abuses of human rights. As a result, the colleges were criticised by The Lancet and the British Medical Journal, two of the world’s most widely read medical journals, with the latter accusing RCSI-Bahrain of complicity with the regime. I resigned my Fellowship of the RCPI in protest against that institution’s failure, as I understood it, to enquire as to the welfare of the imprisoned doctors when the then president was in Bahrain in June 2011 for the conferring of degrees. In July 2011, I visited Bahrain as part of a delegation that included Prof Damian McCormack, Senator Averil Power (who questioned the university representatives at the recent Oireachtas meeting), David Andrews, former foreign affairs minister, and MEP Marian Harkin. During a two-day visit, we met close to 100 people from all sides of Bahraini life. We were brought to the house of a family that had suffered dearly in the aftermath of the protests, where 27 women and men were gathered to represent doctors who had been released from prison to await trial, and the spouses and children of doctors detained in prison. At the end of our visit, each member of our delegation was in no doubt but that doctors and other medical personnel had been subjected to human rights abuses that included kidnapping, detention without trial in solitary confinement, and the extraction of confessions under torture. I think it is fair so say that protests from concerned doctors and humanitarian bodies have had little influence in persuading the RCSI to act — in a way that I would view as — positively on behalf of medical staff who have suffered dearly in the performance of their duties in Bahrain. However, recently a group of concerned lawyers, led by Gearóid Ó Cuinn, have applied their collective expertise to bring legal pressure to bear on the College. Ceartas is an independent non-profit organisation that seeks to promote the enforcement of human rights standards internationally through innovative legal actions. In pursuit of this ideal, the group has drafted a comprehensive document entitled ‘Human Rights Law and the Accreditation of RCSI-Bahrain: Submission to the Irish Medical Council’, in which it examines how ongoing human rights concerns relate to RCSI-Bahrain and how they come within the scope of the World Federation for Medical Education Standards used by the Irish Medical Council (IMC). The document points out, moreover, that as the IMC is a public body it is obliged to act in a manner compliant with Ireland’s human rights obligations, and that unconditional accreditation of the RCSI-Bahrain would represent a failure to respect Ireland’s human rights obligations. Against this background, RCSI and NUI representatives made submissions to the Oireachtas in which they both stressed the importance of the internationalisation of Irish universities and the valuable roles that these institutions have played in these endeavours. Of course, this is not the issue; nobody is denying their achievement in exporting health education to countries that cannot provide it themselves, nor is anyone denying the benefit of such endeavours. Turning to the individual submissions to the Oireachtas, it is striking how each vied with the other in claiming verbal pride of place for Ireland in enhancing “the overall reputation of Irish higher education institutions in the competitive international market where evidence of the quality of translational activity was essential”. Prof James Finucane, former Chairman of the Department of Medicine at RCSI-Bahrain, claimed that torture never occurred in Bahraini hospitals despite the fact that it is clearly documented that the Bahrain Defence Force took control of the entire Salmaniya Medical Complex in the Spring rising and placed injured persons, whom it sought to keep under its control, in a special ward of the hospital. One has to ask with incredulity: does RCSI-Dublin permit its Fellows to be dragged off in the darkness of night, to be imprisoned in solitary confinement without trial, to be tortured and sexually abused, to be banned from practising medicine following acquittal and release from prison? But there was more, when Prof Finucane adds: “I have not been aware in the five years I have been here of a single incident of a sectarian nature.” Does Prof Finucane not recall that one of the long-serving lecturers in his Department of Medicine was kidnapped from her home, imprisoned and tortured by the security forces? Does he not remember that during her sudden and unexplained absence from work the College did not even enquire as to her fate? Likewise, one has to ask how Prof Cathal Kelly, CEO of the RCSI, could fail to recall that RCSI-Bahrain called in students identified in the protests to sign affidavits that they would not participate in political demonstrations and would swear an oath of loyalty to the King, and that he had had to acknowledge later that such “actions were unacceptable and should never have happened”? Indeed, the President of RCSI-Bahrain “unreservedly apologised” to these students and returned the signed and witnessed documents to them. Apologies, or acknowledgement of past wrongdoing, do not expiate RCSI-Bahrain but should serve rather to ensure that the ongoing infringement of human rights against medical personnel are addressed by making the Bahraini regime aware that such practices are incompatible with modern standards of medical education and practice. The IMC is going to visit Bahrain shortly to decide if RCSI-Bahrain should receive accreditation. Senator Averil Power has sought assurances from Caroline Spillane, CEO of the IMC, as to the independence of the forthcoming visit and one has to share her concern that the IMC will easily be able to act independently of the influences of RCSI-Bahrain and the Bahraini authorities, as well as the domestic influence of NUI and RCSI. The visiting representatives should ensure that aside from visiting RCSI-Bahrain and the Salmaniya Medical Complex they also interview the doctors who have been released from prison, the families of those who remain imprisoned, the students who were required to sign documents denying them the right to political protest, the members of staff at RCSI-Bahrain who were imprisoned and they would also be well advised to discuss the governance of RCSI-Bahrain with the former President, Prof Tom Collins. It would also be advantageous to meet Nabeel Rajab, President of the Bahrain Centre for Human Rights, who hopefully will have been released from his latest term of imprisonment by the time of the IMC visit to Bahrain. 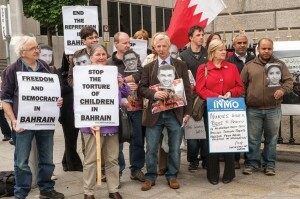 The final decision as to whether the IMC can approve RCSI-Bahrain must surely be decided on the simple principle: if what is occurring in RCSI-Bahrain could not occur in RCSI-Dublin because it would be seen as a disregard for human rights, then the former must be adjudged as applying standards that are not representative of the standards that pertain in Ireland. This entry was posted in Crime, Economic, social, trade union, etc., Human rights, Medicine, health and tagged Bahrain, Ireland, torture by petrel41. Bookmark the permalink.